3 months old, Sofia weighs more than 5kg already! Sekampit beras. Hahahah. We took Sofia for her 3 months checkup and she got a shot on her right hamstring. 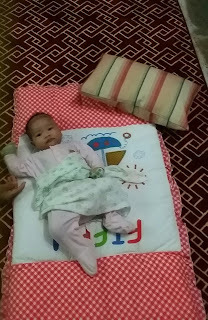 The doctor said there's no need to check on her weight but since we didn't weigh her on her two months checkup, this mother is curios to know how much she weigh already. More than 5kg; can't be too accurate as we weigh her fully clothed including her pampers. Aah... Getting emotional. Dulu 3kg je. We were told she might get fever after the shot. We already had the medicine, given during Sofia's first month checkup but not used yet. The doctor said we can still use it. Oh by the way, when we laid her on the bed, waiting for the doctor to give her the shot, she was so happy smiling all the way. Alahai... She cried only for a while. After that we dropped by to get groceries. We stayed in the car, only mum went out. She was happy all the way, smiling and babbling from her car seat. Macam tak ada apa-apa. But by evening, mum said Sofia might have fever because badan dedar. Honestly, I didn't know what 'dedar' is... But Sofia did looked uncomfortable and her body was quite warm. We gave her medicine and formula milk. 4 oz sekali hadap... I was surprised and worried. Such appetite she had demam-demam pun. Still cannot sleep. She's a good kid. Mudah-mudahan... Eventhough she had fever, she didn't cry or wail, she just kept quiet but still looking uneasy (susah tidur, pusing-pusing). So I laid her on the Fiffy mattress and lie next to her. Just to soothe her. anak demam ni, sindrom mak mak mesti gelabah. sbb klau boleh, nak anak sehat sepanjang masa. kan? mek pn same. tido tk lena. kejap kejap amek termo test suhu --' tgk jam setiap masa untuk pastikan ubat cukup. nak bg hilang cepat. Haah... First time dia demam ni. Kesian je kat dia. guilty sebab ape? main hp ke? ni dah baik demam ke belom?